During its 59th annual meeting, held in Indianapolis, Indiana, Sept. 9-12, 2018, the National Association of State Boating Law Administrators (NASBLA) elected Lieutenant Mark Brown, Boating Law Administrator for Oklahoma, as President of the nonprofit organization for the 2018-2019 year. He succeeds Tom Guess, Virginia’s boating law administrator. As a member of the National Association of State Boating Law Administrators, Lt. Brown has served on the NASBLA Education & Outreach Committee in many capacities ranging from committee member to committee chairman, working on multiple committee charges and projects. Lt. Brown has served on the NASBLA Executive Board since 2014. As a member of the NASBLA Board, he has been the Board liaison for the NASBLA Vessel Identification, Registration and Titling Committee, the NASBLA Education & Outreach Committee and the NASBLA National Boating Education Standards Panel. Lt. Brown has also served as a commissioner on NASBLA’s Certified Recreational Boating Professional (CRBP) Commission and is an active member of the NASBLA Boating Education Advisory Panel (BEAP). Lt. Mark Brown began serving the citizens of Oklahoma in July 1986, as a state trooper assigned to the Oklahoma Department of Public Safety, Highway Patrol Marine Enforcement Section. During his career, Lt. Brown has been program supervisor for the Marine Law Enforcement Training program, the Boating Safety Education and Outreach program, the Marine Theft and Vessel Identification Unit, and the Boating Accident Data Entry and Analysis program. 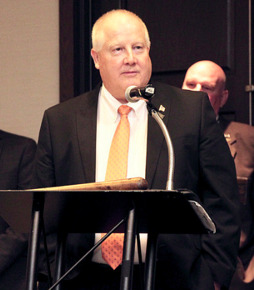 He is a subject matter expert for Oklahoma Boating Laws, Special Rules and Regulations and has appeared before Oklahoma Legislative Committees on numerous occasions and participated in key interim studies to provide insight into boating safety issues and assisted in drafting bills that impact the safety of Oklahoma’s lakes and waterways.